To play the videos, you need Flash 8. It's the latest version of Adobe Macromedia Flash, a very common plug-in. I am sure that you have the older version, Flash MX, in your computer now. You just need to update it. Below, you can see two pictures that are almosgt identical. 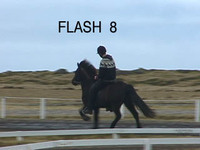 One is labeled Flash MX and the other is Flash 8. When you click on a picture in hestablog, a pop-up window with a video player appears. Click on the PLAY button, and you will see a movie. Try it on the image on the left, FLASH MX. When you are done, close the window and click on the right image, FLASH 8. If you do not see the same movie, you need Flash 8. It it is a free, safe, very useful upgrade from Adobe. Here is an automaic updater. Follow the instructions, and come back and enjoy the videos! If you still need help, you can contact me through the comments field, but you can also take the advice I always give: Ask a kid! I would really appreciate it if you could leave a comment below on your reactions to having to update your copy of Flash. I have the feeling, but no solid information, that people are hesitant to go to the Adobe site unless they are are pretty computer-literate. Some feedback would help me figure this out. Thanks. Pix look great. Last I heard from you, you were moving to the homeland, Brooklyn. Flash Basic 8 costs $399. Did you say it was free? I just love your wesite! It took me a little while to figure out this flash 8 stuff, but is was actually really easy to install. The video's are great. I want to go to Iceland right now! Would prefer if this worked in quicktime for Mac users. Amazing video, though. very easy to install, even for non technical people like myself. Your videos are an amazing window and are greatly appreciated by someone who has never been to Iceland. They really give me insight into these horses.